Two weeks after Republican Arizona lawmakers narrowly approved a massive expansion of the state’s private school voucher program, the national group pushing the effort planned to host a free lunch at the state Capitol to thank lawmakers. Then, Thursday’s food truck event sponsored by the American Federation for Children was abruptly cancelled by the speaker of the House. Republican Speaker J.D. Mesnard said he called off the “Thank You to the Legislators” luncheon because it was ill-timed and emotions are still running high at the Capitol. Kim Martinez, communications director for the American Federal for Children’s Arizona branch, said the luncheon offer wasn’t intended to be political. 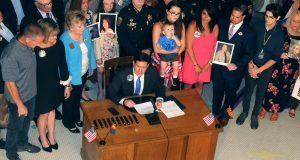 Instead, it grew out of a visit to the Capitol by children with autism-spectrum disorders who benefit from the voucher program to lead the Pledge of Allegiance on the House floor. The group wanted to provide the students lunch, then decided to invite lawmakers and staff. Democrats who opposed the measure said they weren’t aware that the luncheon had been scheduled, although usually all lawmakers get invitations. And the “thank you” usually isn’t so clear. “We have other issues we need to focus on and so I’m trying to do my best to be a peacemaker,” he said. This was a wise decision by Mesnard. But the wiser decision would have been not to pass the bill in the first place. If my tax dollars are going toward sending a child to a private school, then I want assurances that the private school is being forced to follow all the guidelines and federal laws that govern Public School Districts and Charter Schools (also public schools in Arizona). Robbing public schools of more money to put toward private schools is a travesty. I think canceling the lunch is wise. For the good, these types of public policy instruments (Vouchers, Tax Credits, and School Tuition Organizations) ostensibly do the end result is the relentless shift of wealth to the top 10% in society.